Frank Robinson, truly a baseball player and figure worthy of a select pantheon of greatness, died yesterday, at the age of 83. His playing career (the only player to be voted most valuable in both the National and American Leagues, essentially the best player on five pennant and two World Series winning teams and so much more) and his pioneering effort, as baseball’s first black manager are well documented, as the great, historic achievements they are. I can and eventually will add so much more as Frank was one of my favorite and one of the greatest players of not only his GREAT (less players, ALL players, more intensity, fundamentals and so on) era, but any in baseball’s long history. That game seems so “near” in my mind, maybe because on this couch sat Jack Locker, an American League fan and a contemporary of my father, an N.L. rooter. Unlike kids today, I at least greeted company and with Jack especially and regarding sports, it was fun. That night Jack, Dad, and 15 year old Andy B marveled at the following Frank baseball exploit. #6 was in the glorious Saturday daytime and tied, bottom 10 and the Buccos leading the “Classic,” (3-2). Frank walked, by the way a “specialty” of his along with his penchant for getting hit by pitches, as he stood right over the plate. Mervin Rettenmund, who the next day would also hit one up the middle, but 24 hours later Jackie Hernandez fielded and threw him out, yielding a Pirates’ crown, singled up the middle. Mr. Robinson a great and intense, even ferocious, base runner went from first to third, just beating the throw. Next, Brooks, another Robinson and another great, hit a fly ball to medium center, Frank tagged up and slid home safely– broadcasters Jim Simpson (radio) and Curt Gowdy (television) intoning the manifestation of a game 7 the next day, doing so long before Buck and son did so, the latter getting the fanfare. Where do you go now, Frank?! The eternal question. My mind and imagination (you know what Mr. Einstein said regarding imagination) are rocking, words to whatever this is (cyberspace, I suppose) not so easy. Something out there/God/a force, perhaps, has been too “random,” surely it is easy and justifiable to feel that way, if for no other reason, life on earth is finite. However in life, there is great and once baseball, (the game still is) its time, my age, the associations, Chuck Thompson, Bill O’Donnell and at times, John Gordon on Orioles radio 11 WBAL, augmented that greatness. Thus I volunteer Frank has been told to slide hard, go all out and you will be there. Guess who in redundant fashion told Frank to slide hard. Guess who volunteered to play second base, you guessed it God. Click below to view Frank’s great base running to help the O’s win #6 of the ’71 W.S. 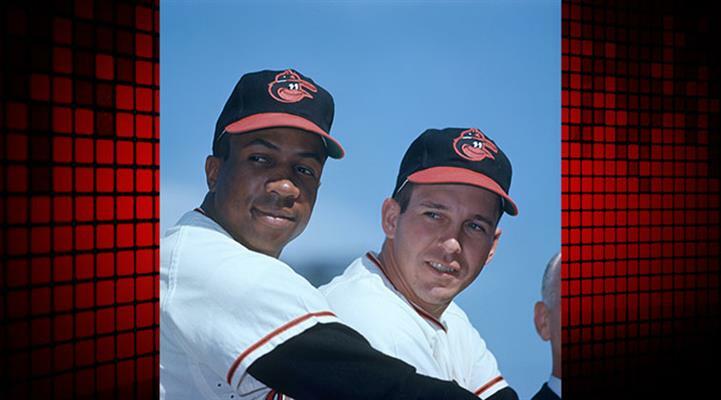 Among other tremendous achievements, Frank and Brooks, pictured left to right above, hit consecutive first inning, game 1, 1966 World Series home runs off Hall of Fame pitcher, Don Drysdale to get the Orioles/”The Birds,” off to a “flying” start, en route to an incredible 4 game sweep, of the defending champion, Los Angeles Dodgers.